KC treatment should be handled by an experienced Optometrist. Keratoconus is a rare condition where the cornea of the eye becomes cone-shaped over time. The cornea is the hardened clear covering over the lens in the center of the eye, and normally it is visible as a slightly rounded bulge over the iris and pupil. How is Keratoconus Different Than Other Eye Conditions? There are rigid gas permeable contact lenses that provide a greater degree of correction and can address the change in shape caused by Keratoconus. Another option are hybrid lenses. These have a hard center area to address the unusual shape of the cornea, but are surrounded by a soft contact lens “skirt” that reduces the discomfort and can provide for a longer term wear. There are also options for custom contact lenses or special lenses called “scleral contact lenses” that actually extend out to the sclera, or white, of the eye. Dr. Leonard can discuss these options with you. Dr Leonard is familiar with these PROSE type scleral lenses including Acculens Maxim, Alden Zenlens, Rose K2XL, EZ Fit, One Fit and many others. Another solution may be a new product known as Ultra Health and Ultra Health FC contacts. These are a special contact lens designed for patients with Keratoconus. They are worn like standard contact lenses, resolve vision and ghosting problems, and avoid risky surgeries. An experienced Keratoconus doctor can help you understand your options and if ClearKone contacts are the right answer for you. If those Keratoconus contact lens treatments do not help, then you might choose Keratoconus surgery. Surgical solutions include standard laser surgery if the Keratoconus is not very advanced. In more advanced cases, surgical correction through reshaping runs a risk of scarring. A better option in that case is either a donut-shaped corneal insert or a cornea transplant. Both of these are fairly high-risk surgeries. Another newer option is a procedure called “collagen cross-linking” which is a treatment that “firms up” the substance the cornea is made of, to reduce the ongoing deformation caused by Keratoconus. What Should You Do About Your Keratoconus? There are several treatments for Keratoconus. The one that is right for you depends greatly on how severe your condition is. The most important part of your decision, though, may not be what Keratoconus treatment to choose, but which Keratoconus doctor you want to trust with the decisions about your eyes. Dr. Barry Leonard has been treating Keratoconus since the 1980’s, soon after he discovered he had Keratoconus himself. That’s right…He’s a patient, too. Not many eye doctors are properly trained to treat Keratoconus, but patients from both inside and outside of California have traveled hundreds of miles just to be seen by Dr. Leonard. Make your own Keratoconus Appointment with Dr. Barry Leonard here. Or you can call him at 818-891-6711. Dr. Leonard uses digital imagery to get a complete picture of your eye health. 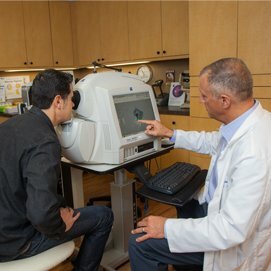 Keratoconus is one of the things he can detect with the cutting-edge technology he has in his SFV optometry office.